← Throw Caution to the Wind tank–complete!! Did you know that knitting blogger Kerstin is a bad influence? Well, she is. 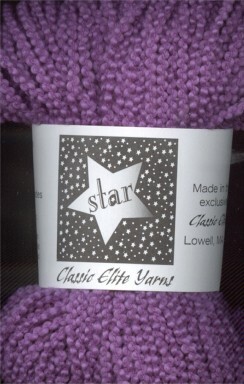 She just happens to mention Classic Elite Star, which is composed of 99 percent cotton and 1 percent lycra or something, on her blog, so of course I became intrigued. Well, two ebay auctions later, I am the proud owner of 9 skeins of Classic Elite Star, 4 in chartreuse and 5 in burgundy! It’s a disease. Peter looked at the blog today, and he commented: “There are too many pictures of you on there.” Well, if it weren’t for my insane, sabotaging brother, there would not be so many photos of me and my head (nor would there be crazy scribblings about dogs eating cats and such). So there. That yarn looks so awesome!! Ebay is my weakness…but even moreso is homemade soaps – even though I made them myself I always shop ebay for cool bundles of homemade soaps to try. Just discovered your blog and read it all the way though. I love your knitting, your dog is adorable, and everything you cook sounds divine. And since I am the devil, I shall tempt you. I have a Japanese-bought Sony Cybershot camera. It isn’t the same one you showed- orange??? I need!- but it was set to Japanese language when I got it and we were able to switch it to English. I say go for it!